One of the most popular recipes on my site ever since I started it has been my almond shortbread cookie. This is one of the simplest cookies, as well as one of the most versatile. It doesn’t involve any eggs or baking powder, so it doesn’t rise and it’s very easy to shape it exactly the way that you want it. And it cooks up with a lovely crumble, very short, crispy and light on the bottom, and even and delicious on top. The versatility of this cookie can easily be seen when you make a few minor adjustments to the recipe. 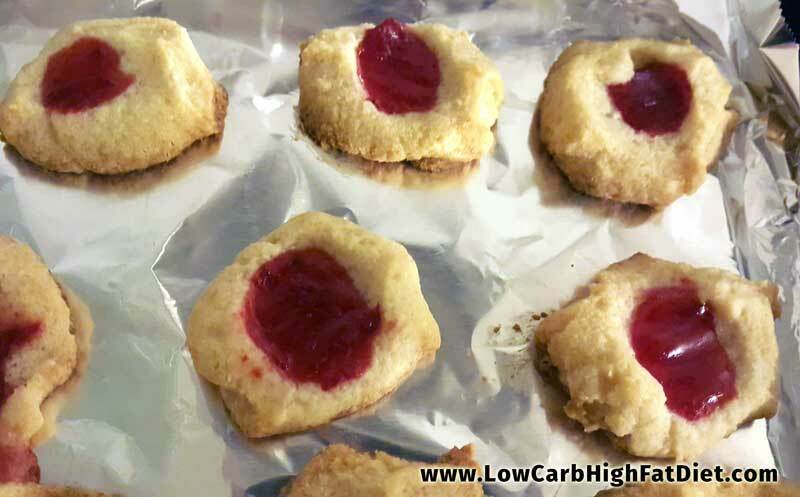 For example, this week I was feeling like some classic jam thumbprint cookies. You remember those? They’re the ones that you make by rolling the dough into a ball and then sticking your thumb in the middle and scooping in a little dollop of jam. Then when you bake them, the jam melts into the cookie and creates this lovely pool of sweet sticky deliciousness, like a little tiny tart. Thanks to the abundance of sugar-free jams and jellies available these days, this favorite childhood recipe is no longer out of reach for those of us following a low-carb high-fat diet. So I took another look at my shortbread cookie recipe, and I decided that it could use some minor adjustments to make it work perfectly. Of course if you prefer to use the original recipe that’s fine. You might not get exactly the same texture and flavor as I did, but it will still be delicious. For my taste, the dough wasn’t quite sweet enough for the type of cookie that I was imagining. I like my jam thumbprint cookies to be sweet from top to bottom. So I added a little bit of Nature-Mate Erythritol/Stevia blend. There are several brands on the market that are similar. A tablespoon of this is about as sweet as 2 tablespoons of regular sugar. I also boosted the vanilla from an optional flavoring to a full teaspoon. I also took the temperature of the oven up from 300°F to 325°F. With shortbread cookies, you want a soft even color from top to bottom. With a jam thumbprint, it’s nice to have the jam bubbly, the cookie light, and the bottom a little bit brown. The cooking time is 15 to 20 minutes, but watch it carefully as it gets to the end. Because of the almond flour, you want to make sure not to let it burn on the edges, and it can start to burn very quickly. Such a wide variety of sugar-free and low-carb jams are on the market these days that it’s really up to you which ones you choose. I went traditional, with a strawberry jam. You can almost certainly get these at your grocery store, and of course it’s very easy to order them online as well. Mix in the vanilla, salt, Erithrytol/Stevia blend, and liquid Splenda. form 12 round balls on a baking sheet from the dough. Bake for 15-20 minutes at 325°F.